In 2014 a nationwide search began for a new Executive Director as Jacqueline Shuck retired with 25 years of service to the Commission. Members of the Commission identified Timothy T. Bradshaw, A.A.E. as the most skilled and qualified candidate, with the airport experience and vision necessary to lead this region’s largest airport to continued growth and prosperity. In October 2014, Timothy Bradshaw took the helm of Executive Director of the Roanoke-Blacksburg Regional Airport. As Executive Director, Tim provides long-range planning, oversees service and fiscal improvements and works with local, regional and federal authorities. He reports to the Roanoke Regional Airport Commission. Bradshaw brings a vast working knowledge of airports thanks to his aviation experience in cities that include Louisville, KY, Owensboro, KY, Bowling Green, KY and Teterboro, NJ, and most recently Cedar Rapids, Iowa, where he served as Airport Director of the Eastern Iowa Airport. He is a native of Roanoke and 1976 graduate of William Byrd High School. He received his bachelor’s degree in Aviation Business Administration from Embry-Riddle Aeronautical University and a master’s degree in Public Administration from Western Kentucky University. 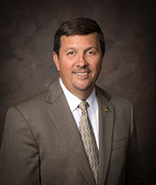 Executive Director: Tim Bradshaw, A.A.E.